"Iron Kissed", the third book in the Mercedes Thompson series focuses more on the fae. The werewolves, of course, as Mercy's family (whether she wants them or not) also have a major role, but the vampires are conspicuous by their absence. The reason for their absence is that the events of Iron Kissed take place in less than a week -- and because I had enough to juggle and the vampire situation Mercy has put herself in is going to require more than a brief appearance will answer. Like most of my books, this one held a lot of surprizes for me. I had intended for Mercy to choose her man in this book, but I didn't expect it to happen the way it did. I also found out a few things I didn't know about some of the characters. It made me like some of them more and others less. It also made me realize that one of the terrific things about writing a series is the ability to get to know more about the bit players. In a single book, or even a duology, there are only so many pages to develop characters and I have to restrict myself to only a few. A series is not so restrictive. Source: Info in the About This Book was taken from the author's website at http://www.patriciabriggs.com/books/ironKissed.shtml on 24/04/2010. 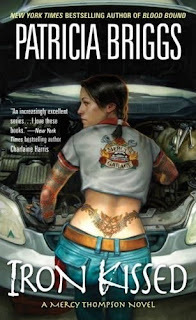 This book continues the adventures of Mercedes Thompson "Mercy", a mechanic and a coyote shapeshifter. Here she makes a choice between her two men, er, werewolves, I mean. Battles evil and not so evil forces where friends seems to become enemies and enemies are allies after all. Mercy's friend, Zee, who is a fae, is arrested by human police for murder. Mercy is trying to help Zee get cleared of the charges and keep him from getting killed by the Gray Lords (fae ruling body) as a sacrifice to keep the fae secrets from the rest of the world. Still a very good read... but compared to Moon Called and Blood Bound, it is not as good as the previous two. Maybe I was expecting too much... or I was just spoiled by the good quality of the previous books... and also, I did not appreciate the dark turn of the story... but I have to say the story-telling quality is still a masterpiece.